Edward Alphonso Chapman was born on 20 April 1908 at Missouri. He was the son of James Edward Chapman and Mollie May Tryon. Edward Alphonso Chapman died in May 1978 at age 70. [S244] U.S. Federal Census 1910 U.S. Federal Census, by Ancestry.com, Year: 1910; Census Place: Osage, Morgan, Missouri; Roll T624_801; Page: 7A; Enumeration District: 115; Image: 911. [S243] U.S. Federal Census 1920 U.S. Federal Census, by Ancestry.com, Year: 1920;Census Place: Commerce, Ottawa, Oklahoma; Roll T625_1481; Page: 12A; Enumeration District: 132; Image: 829. Married Name Her married name was Johnson. Name Variation Anna Brooks Chapman was also known as Annie B.
Anna Brooks Chapman married Claude Johnson. Anna Brooks Chapman was born on 22 March 1910 at Missouri. She was the daughter of James Edward Chapman and Mollie May Tryon. Anna Brooks Chapman died on 3 February 1944 at age 33. Louisa Spence was born circa 1844 at Tennessee. She was the daughter of Bartholomew Spence and Eliza Ann Maupin. [S248] U.S. Federal Census 1860 U.S. Federal Census, by Ancestry.com, Year: 1860; Census Place: Campbell, Greene, Missouri; Roll M653_621; Page: 119; Image: 119; Family History Library Film: 803621. William Adams was born in March 1837 at Kentucky. He married Susan A. (?) circa 1876. William Adams died after 1900. [S245] U.S. Federal Census 1900 U.S. Federal Census, by Ancestry.com, Year: 1900; Census Place: Osage, Morgan, Missouri; Roll T623_877; Page: 1A; Enumeration District: 78. Married Name circa 1876 As of circa 1876,her married name was Adams. Susan A. (?) was born in November 1850 at Missouri. She married William Adams circa 1876. Susan A. (?) died after 1900. Susan A. (?) had 10 with 5 living in 1900 children. Name Variation James Adams was also known as Adam. James Adams was born in July 1886 at Missouri. He was the son of William Adams and Susan A. (?). [S243] U.S. Federal Census 1920 U.S. Federal Census, by Ancestry.com, Year: 1920;Census Place: Kansas City Ward 6, Jackson, Missouri; Roll T625_926; Page: 4B; Enumeration District: 103; Image: 252. Elta Adams was born in February 1889 at Missouri. She was the daughter of William Adams and Susan A. (?). Susan A. Adams was born in January 1891 at Missouri. Name Variation William E. Adams was also known as Willie. Name Variation William E. Adams was also known as Adam. William E. Adams was born on 2 January 1911 at Missouri. He was the son of Stephen Elvis Adams and Lucretia McMillen. 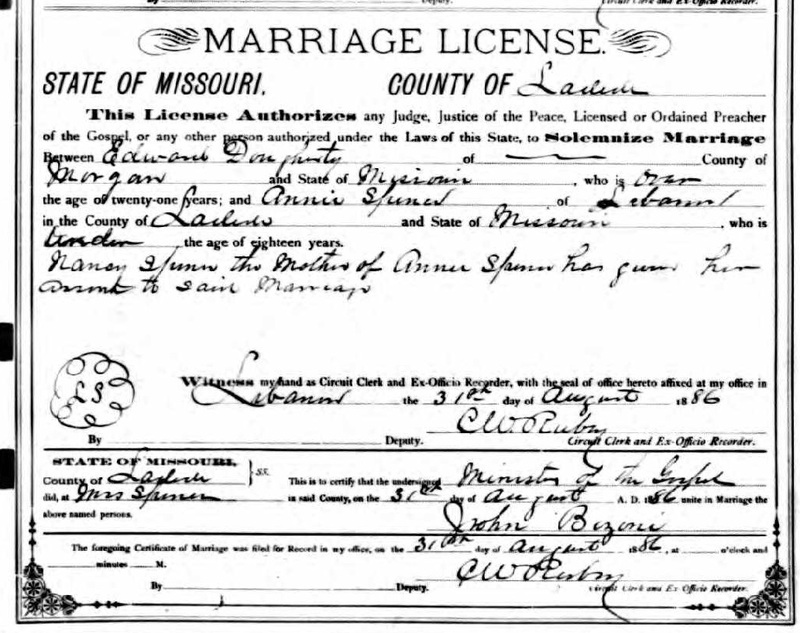 William E. Adams married Bonita Lavern Lang on 5 March 1938. William E. Adams died on 26 April 1989 at Topeka, Shawnee, Kansas, at age 78. William E. Adams lived in 1974 at Topeka, Kansas. [S250] U.S. Federal Census 1930 U.S. Federal Census, by Ancestry.com, Year: 1930; Census Place: Topeka, Shawnee, Kansas; Roll 722; Page: 3A; Enumeration District: 17; Image: 279.0. [S373] U.S. Federal Census 1940 U.S. Federal Census, by Ancestry.com, Year: 1940; Census Place: Topeka, Shawnee, Kansas; Roll: T627_1259; Page: 2B; Enumeration District: 89-21C. Married Name 1888 As of 1888,her married name was Spence. Mary Ellen Jarrell was born in August 1873 at Missouri. She married Wilburn Leonard Spence, son of Thomas Henry Spence and Nancy Jane Buckley, in 1888. Mary Ellen Jarrell died on 1 April 1969 at Oklahoma at age 95. Mary Ellen Jarrell had 4 with 3 living in 1900 children. [S245] U.S. Federal Census 1900 U.S. Federal Census, by Ancestry.com, Year: 1900; Census Place: Cherokee, Benton, Arkansas; Roll: 50; Page: 4A; Enumeration District: 0006; FHL microfilm: 1240050. Name Variation Edward Dougherty was also known as Daugherty. Edward Dougherty was born before 1865. 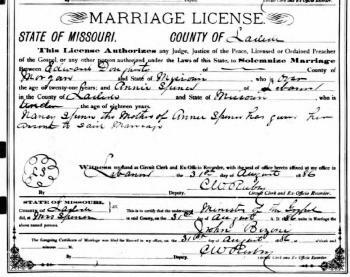 He married Annie Spence, daughter of Thomas Henry Spence and Nancy Jane Buckley, on 31 August 1886 at Laclede, Missouri, Marriage license of Edward Dougherty and Annie Spence. Annie's mother, Nancy, gave her consent to the marriage. Edward Dougherty lived in 1886 at Morgan, Missouri. Name Variation Charles Wofford was also known as Charley. Charles Wofford was born in April 1872 at Oklahoma. He married Laine May Spence, daughter of Thomas Henry Spence and Nancy Jane Buckley, in 1893 at Cherokee City, Benton, Arkansas. Charles Wofford was buried after 1930 at Wofford Cemetery, Row, Delaware, Oklahoma. [S245] U.S. Federal Census 1900 U.S. Federal Census, by Ancestry.com, Year: 1900; Census Place: Township 21, Cherokee Nation, Indian Territory; Page: 21; Enumeration District: 0026; FHL microfilm: 1241844. [S244] U.S. Federal Census 1910 U.S. Federal Census, by Ancestry.com, Year: 1910; Census Place: Township 2, Delaware, Oklahoma; Roll: T624_1250; Page: 10A; Enumeration District: 0057; FHL microfilm: 1375263. [S243] U.S. Federal Census 1920 U.S. Federal Census, by Ancestry.com, Year: 1920; Census Place: Township 2, Delaware, Oklahoma; Roll: T625_1458; Page: 6B; Enumeration District: 36; Image: 493. [S250] U.S. Federal Census 1930 U.S. Federal Census, by Ancestry.com, Year: 1930; Census Place: Mosely, Delaware, Oklahoma; Roll: 1902; Page: 5A; Enumeration District: 0006; Image: 107.0; FHL microfilm: 2341636. Married Name 9 May 1897 As of 9 May 1897,her married name was Spence. Cora T. Hall was born in May 1870 at Missouri. She married Orvel Leroy Spence, son of Thomas Henry Spence and Nancy Jane Buckley, on 9 May 1897 at Benton, Arkansas. Cora T. Hall and Orvel Leroy Spence were divorced before 1920. Cora T. Hall had 2 with 1 living in 1900 children. She had 4 with 4 living in 1910 children. [S245] U.S. Federal Census 1900 U.S. Federal Census, by Ancestry.com, Year: 1900; Census Place: Township 21, Cherokee Nation, Indian Territory; Roll: T623_1844; Enumeration District: 26. 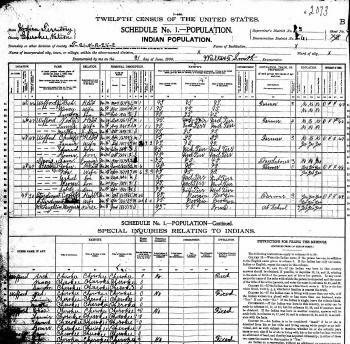 [S244] U.S. Federal Census 1910 U.S. Federal Census, by Ancestry.com, Year: 1910; Census Place: McMurray, Skagit, Washington; Roll: T624_1667; Page: 14A; Enumeration District: 0255; FHL microfilm: 1375680. Married Name Her married name was Hempel. Dorothy Chapman married Herman E. Hempel. Dorothy Chapman was born on 31 January 1919 at twin with Aubrey, Missouri. Dorothy Chapman died on 8 March 2007 at age 88. She was buried after 8 March 2007 at Old Cave Spring Cemetery, Sullivan, Franklin, Missouri. [S250] U.S. Federal Census 1930 U.S. Federal Census, by Ancestry.com, Year: 1930; Census Place: Osage, Morgan, Missouri; Roll 1213; Page: 4A; Enumeration District: 12; Image: 1046.0. Aubrey Chapman was born on 31 January 1919 at twin with Dorothy, Missouri. Aubrey Chapman died on 5 January 1979 at age 59. Claude Johnson married Anna Brooks Chapman, daughter of James Edward Chapman and Mollie May Tryon. Claude Johnson was born in 1902. Married Name before 1940 As of before 1940,her married name was Mullineaux. Roxie Ella Barnes was born on 22 February 1912 at Oklahoma. She married Reverand Emmett L. Mullineaux, son of Joseph William Mullineaux and Martha Eveline Bowler, before 1940. Roxie Ella Barnes and Reverand Emmett L. Mullineaux were divorced before 1958. Roxie Ella Barnes died on 18 November 1990 at age 78. She was buried after 18 November 1990 at White Chapel Memorial Gardens, Wichita, Sedgwick, Kansas. 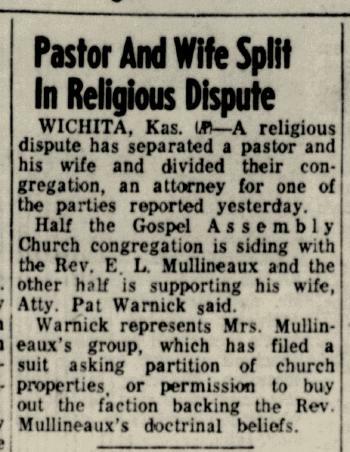 In 1955 at Wichita, Kansas, Rev E L Mullineaux and wife split over religious dispute. [S373] U.S. Federal Census 1940 U.S. Federal Census, by Ancestry.com, Year: 1940; Census Place: Kansas City, Jackson, Missouri; Roll: T627_2165; Page: 1B; Enumeration District: 116-23. Dale Keith Piddington married Helen J. Weittenhiller, daughter of Byron M. Weittenhiller and Mabel E. (?). Dale Keith Piddington was born on 6 May 1922 at Wisconsin. He was the son of Virgil Piddington and Mary Isabelle Thomas. Dale Keith Piddington died on 2 April 1990 at Grant, Wisconsin, at age 67. In February 1968 at Platteville, Grant, Wisconsin, Platteville Hires Two Patrolmen including Dale Piddington. [S250] U.S. Federal Census 1930 U.S. Federal Census, by Ancestry.com, Year: 1930; Census Place: Paris, Grant, Wisconsin; Roll 2574; Page: 7B; Enumeration District: 37; Image: 580.0. [S373] U.S. Federal Census 1940 U.S. Federal Census, by Ancestry.com, Year: 1940; Census Place: Paris, Grant, Wisconsin; Roll: T627_4481; Page: 10A; Enumeration District: 22-37. Leon Thomas Piddington married (?) Sverson, daughter of Garfield Sverson. Leon Thomas Piddington was born on 1 July 1926 at Wisconsin. Leon Thomas Piddington died on 23 November 1988 at age 62. Name Variation Maynard John Piddington was also known as Minard J.
Maynard John Piddington married Katheryn K. Willard. Maynard John Piddington was born on 26 March 1928 at Platteville, Sauk, Wisconsin. Maynard John Piddington died on 23 September 2004 at Maryland at age 76 Maynard J. Piddington of Havre de Grace, a research aerospace engineer for Aberdeen Proving Ground and a veteran of the Korean Conflict, died September 23 at John Hopkins Hospital. He was 76. Mr. Piddington was born in Platteville, Wisc. to the late Virgil and Isabelle Piddington. He was a member of the American Bowling Congress, Swan Creek Golg Club, American Legion, Bowling Hall of Fame , he was an avid card player and enjoyed ballroom dancing. He is survived by his wife Katheryn K. (Willard) Piddington, a son Thomas J. Piddington of Abingdon and a daughter Barbara Ann Piddington of Riverside, a brother Dean Piddington of Platteville, WI and a sister Betty Stark also of Platteville. He is also survived by two grandchildren and two great grandchildren. Services were September 27th at 1:00pm at the Tarring-Cargo Funeral Home, P.A. Interment was in Harford Memorial Gardens. In lieu of flowers contributions may be made to the American Heart Association or to the Lung Association. Name Variation Dean Wilfred Piddington was also known as Wilfred P.
Name Variation Dean Wilfred Piddington was also known as Wilford P.
Dean Wilfred Piddington was born on 19 May 1924 at Wisconsin. Dean Wilfred Piddington married Ruth E. Bartels, daughter of Frederick E. Bartels and Ruth E. (? ), on 19 May 1949 at Dubuque, Dubuque, Iowa. Dean Wilfred Piddington died on 29 March 2009 at age 84 Dean W. Piddington, age 84, of Platteville, formerly of Hazel Green, passed away on Sunday, March 29, 2009, at Heartland Health Care Center, Platteville. Funeral services will be 6 p.m. Friday, April 3, 2009, at the MELBY-BENDORF FUNERAL HOME, 1245 N. Water St., Platteville. The Rev. Ed Jones will officiate. Burial will be at Big Patch Cemetery with military rites at a later date. Friends may call from 3 p.m. until the time of the service on Friday at the funeral home, where Masonic services will be at 3 p.m. Memorials may be made to the Dean W. Piddington Memorial Fund. The Melby-Bendorf Funeral Home, Platteville, is serving the family. Name Variation Margaret Ellen Gundlach was also known as Gunlach. Married Name 14 June 1938 As of 14 June 1938,her married name was Piddington. Margaret Ellen Gundlach was born on 17 June 1915 at Livingston, Wisconsin. She was the daughter of Otto Frederick Gundlach and Verna Mae Allen. 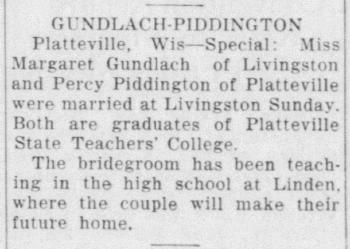 Margaret Ellen Gundlach married Percy Allen Piddington, son of Virgil Piddington and Mary Isabelle Thomas, on 14 June 1938 at Livingston, Wisconsin, Margaret Gundlach and Percy Piddington wedding announcement. 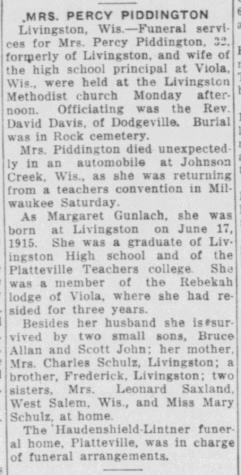 Margaret Ellen Gundlach died on 8 November 1947 at in an automobile accident, Johnson Creek, Wisconsin, at age 32 Mrs Percy Piddington (Margaret Gunlach) obituary. Married Name Her married name was Piddington. Helen J. Weittenhiller married Dale Keith Piddington, son of Virgil Piddington and Mary Isabelle Thomas. Helen J. Weittenhiller was born on 11 May 1929 at Wisconsin. She was the daughter of Byron M. Weittenhiller and Mabel E. (?). Charles Willard McGuire Jr. was born on 1 April 1900 at Indiana. He married Mina Eliazabeth Piddington, daughter of Virgil Piddington and Mary Isabelle Thomas, on 1 April 1952. Charles Willard McGuire Jr. died on 10 April 1968 at Chicago, Cook, Illinois, at age 68. Name Variation Otto Frederick Gundlach was also known as Gunlach. Otto Frederick Gundlach was born in 1892. He married Verna Mae Allen before 1915. Otto Frederick Gundlach died in 1917. Married Name before 1915 As of before 1915,her married name was Gundlach. Married Name after 1917 As of after 1917,her married name was Schulz. Verna Mae Allen was born in 1894. She married Otto Frederick Gundlach before 1915. Verna Mae Allen married Charles Schulz after 1917. Verna Mae Allen died in 1985. Frederick Allen Gundlach was born in 1916. He was the son of Otto Frederick Gundlach and Verna Mae Allen. Frederick Allen Gundlach died in 1987. Duane Schmidt was born on 24 May 1944. He was the son of Elmer G. Schmidt and Muriel M. Wagner. Duane Schmidt died on 15 January 1972 at age 27. 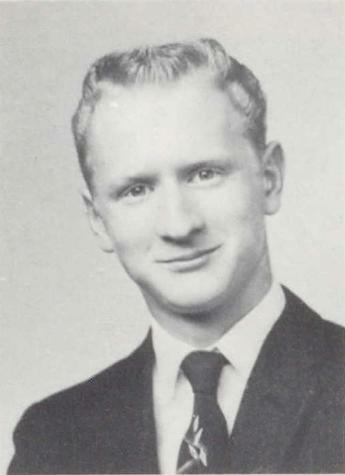 Duane Schmidt graduated in 1962 at Webb High School, Reedsburg, Sauk, Wisconsin. Robert Schmidt was born on 6 April 1941. Robert Schmidt died on 27 July 2000 at age 59. (?) Whitney married Jessie A. Brown circa 1882.